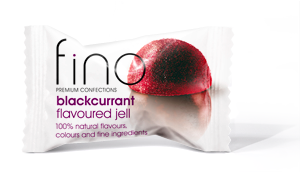 Blackcurrant Flavoured Jells (350g or 500g) by Fino Premium Confections – Stimulate your senses. At Fino we are passionate about producing simply exquisite confections. Our confectioners only use the purest ingredients and natural flavours, masterfully creating the finest taste and textural experience. Indulge yourself or share them with someone special. Ingredients: Sugar, Glucose Syrup (From Wheat*), Water, Gelling Agent (Pectin), Acidity Regulators (Citric Acid, Sodium Citrate), Natural Flavours from Fruits, Natural Colours from Plants, Fruits and Vegetables (Turmeric, Pumpkin and Carrot Extracts, Anthocyanins, Chlorophylls). Uses flavours from natural fruit sources, but in small quantities for the imparted flavour. *This product is gluten free and subject to regular testing. Store your Fino Confections at room temperature away from direct sunlight to ensure optimum product quality and flavour.